Watching Brooklyn based illustrator and author You Byun draw is like witnessing a natural phenomenom. With the tiniest lines, most sensitive details and truly mind-boggling compositions, she manages to create effortlessly sweet and truly enchanting other-worldly images. I had the pleasure of attending the same Master's Program with You and saw first hand her unique approach to creating stories through images. I was thrilled to hear the news that Nancy Paulsen Books (an imprint of Penguin Books) also discovered her amazing talent, with her first published children's book Dream Friends released this month. Dream Friends, is a touching story of a young girl struggling to find friends outside of her dreams, until her dream friend inspires her to make moves towards finding friendships in the real world. The delightful and detailed illustrations have been compared by the New York Times as "reminiscent of the classic 'Goodnight Moon' with its haunted twilight inflected color scheme" and are sure to have children enchanted. Dream Friends has established You Byun as a "major picture book talent", with Publishers Weekly claiming that she has "created a diminutive paradise, a bedtime destination that children will want to visit again and again". We were lucky enough to get together with the talented Ms. Byun, as she allowed us to see her studio where the magic happens, and told us a little bit about her motives behind Dream Friends. WE love hearing how other artists work. TELL US how your studio in brooklyn is set up. In my studio there is a desk, computer, scanner, printer, papers and pens. I have almost nothing on the wall. I keep it simple because I cannot concentrate well when there are other things around me, like other artist's artwork—even when I am a fan of it. A white wall is the best to face. The emptier the better. Sometimes I wish I could have a beautifully decorated studio like my other artists friends; which they seem to have naturally, without trying to decorate. But I am more likely to intentionally getting rid of things around me. I get influenced very easily, and I am afraid that will change my work to a direction where I didn't intend to go. I want to be in a control of what influences me. I can work the best when there is nothing, not even music sometimes. I go through emails while having breakfast. (I usually have breakfast and lunchwhile I am working on something else.) Next, I schedule my day and week.Then usually I do idea sketching, drawing, scanning, photo-shopping, uploading, and work my shop and update my Twitter & Facebook pages. The key is not to get stuck on the internet; I work from home and I barely see other human beings during the week, so I tend to reach out for some communication that way, but sometimes it's very hard to get out of it. In the afternoon, I try to go out for a walk while it's bright outside, making an excuse to buy art supplies, donuts, or groceries. I sometimes go to bookstores just to see what's out there and to read my favorite books. I love to fantasize about my books being in my favorite bookstores, too. In the evening I try to rest, usually watch a movie or read a book, trying to get inspired. I meet friends mostly on the weekend. Whatever I do, I want to get inspired – see things, talk to people, find new images, and more. And I am obsessed with discovering good cheap restaurants! Although I am not sure what this has to do with making art. I guess this is just my hobby. When you FEEL YOUR CREATIVITY IS BLOCKED DURING A JOB, WHAT DO YOU DO TO REFOCUS and get back on track? I do whatever I can. It's like the story, Touching the Void: You try to climb the snow covered mountain after you broke your leg, and, if that doesn't work, you descend down with a hope that there is a way to base camp and survival. But I've also realized creative blocks can come from a lack of desire or passion to achieve new things... then, the only thing I can do is to remember what I love the most. It's very important not to get distracted from achieving what I truly want. DREAM FRIENDS IS A STORY THAT MANY CHILDREN CAN RELATE TO. WAS IT A PERSONAL EXPERIENCE AS A CHILD THAT INSPIRED THE STORY? I moved around a lot as a child, and I tend to get very shy when I meet people at first. I still find it difficult to share myself with others instantly when I meet them. Although once you get to know me better, I am quite silly. When I was even a kid and even more shy, I made friends at a new school by drawing pictures alone at my seat. I drew frogs, famous characters, birds, flowers, whatever I liked at that time. Kids would come up to me wondering what I was drawing. Even if nobody approached me, I still had great time making my own stories of fantasy landscapes. The idea of the story, how Melody made friends, came from this place in my memory. Ultimately, a message I wanted to share in Dream Friends is, enjoy what you do: Even when you are alone, to make your dream comes true. If you do what you truly love, you will sparkle naturally, and that will do some magic and will attract good things! Maybe even in a way you never expected. MELODY IS SO SWEET AND CHILDLIKE. HOW DO YOU KNOW WHAT CHILDREN LOVE WITHOUT HAVING ANY CHILDREN YOURSELF? Good question! There are two types of children's book authors – those who are around children very closely, and others who think with their inner child. Many of my favorite legendary children's book authors didn't have children – such as Beatrix Potter (Peter Rabbit) and Maurice Sendak (Where The Wild Things Are). Also, my all- time favorite, Tomi Ungerer (The Three Robbers, Moon Man), didn't have any children until he already made over 15 children's books. I love being an adult, but I also think it's great to keep my inner child alive. I cherish childhood, and I remember a lot of things from my own childhood. I think it's because I moved around a lot growing up, which made me miss things I left: I made sure I wouldn't forget these. Little things such as grass on the way home, ladybugs on the school fence, the smell of the playground, a little fly which came to rest on my right arm in kindergarten.... the list goes on. So when I write picture books, I want to make something that will be a part of their memories. I want to make picture books that can still be appreciated when the readers are fully grown up, like looking into your old photo album. DREAM FRIENDS IS SUCH A POETIC STORY. WHAT COMES FIRST FOR YOU, THE STORY OR THE ILLUSTRATIONS? Story and image often come at the same time. 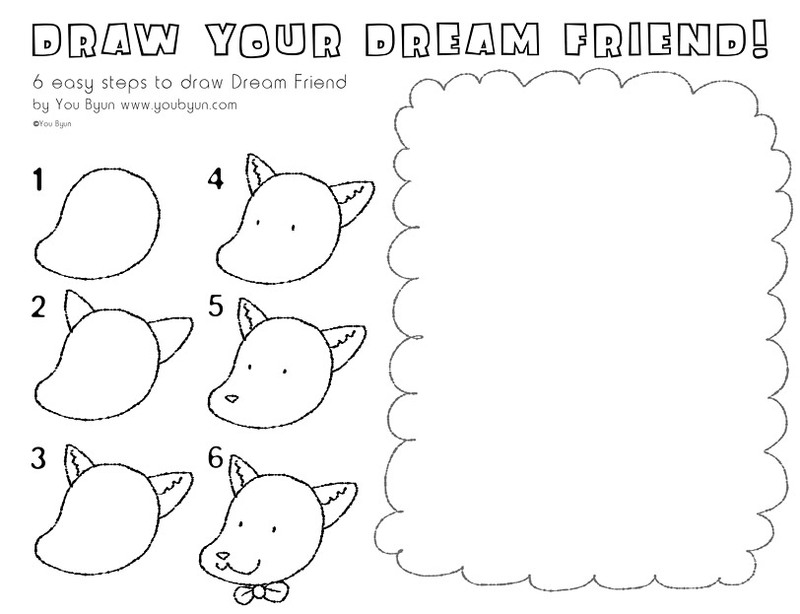 My next book might be different, but for Dream Friends, telling stories with images and minimal text was my goal. It wouldn't be very fun for readers when everything is written down. I want to encourage readers to imagine their own story within the story, or to read the story in the space between the words. Once the book is out there, it's not mine – it belongs to readers. My mission is to give enough space to them. 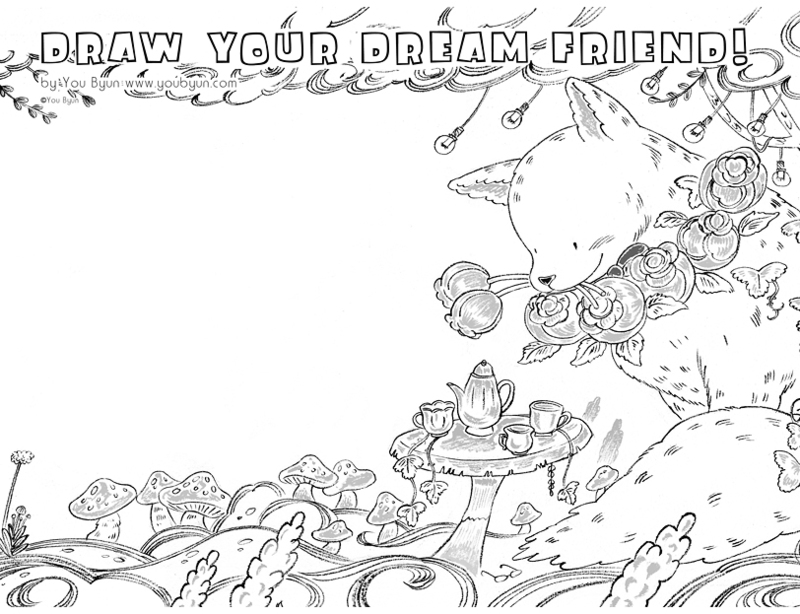 I hid lots of details in Dream Friends; I hope you can find all of them! Another reason I aimed for the minimal text is because I wanted to make a bedtime story book. I love the idea of parents reading books for children at night, I think it's the most peaceful and adoring moment we can ever have as a child. So I kept the story minimal and quite, so children can go to sleep after reading it. Perhaps that may be why you fond Dream Friends poetic. I wanted to make sure when children read the story, they feel like they are already dreaming, and want to go to sleep right away to meet their own dream friends. Want to have fun with your own Dream Friends? Artist/Author/Illustrator You Byun was born in Queens, New York, though she grew up in America, Korea and Japan. Highly recognized for her work in various magazines, awards and competitions, You Byun is currently working on her second children's book, with a division of Penguin Young Readers Group, Nancy Paulsen Books. Her first children's book, Dream Friends, was published this year and released in February 2013. Meet the artists behind the funky forest: Theo Watson and Emily Gobeille. Discover Zachariah OHora's new book, a sweet story about tolerance.